To promote the launch of AC/DC’s new album, “Black Ice,” special AC/DC displays are being set up across the country at your local….Wal-Mart? That’s right, AC/DC will soon be a fixture in men’s apparel at Wal-Mart. 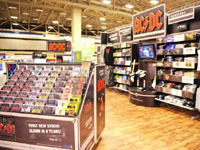 The “Rock Again AC/DC store” displays will feature the new album, “Black Ice,” as well as AC/DC apparel, DVDs, past albums, games and a social gaming station where fans can play Rock Band 2. “Black Ice” will begin selling exclusively at Wal-Mart and Sam’s Club stores beginning October 20, 2008 at 12:01 a.m. The album will cost $11.88. In addition, a unique AC/DC Live: Rock Band Track Pack video game is set to be released early next month, featuring 18 live version AC/DC songs. It, too, will be sold exclusively at Wal-Mart and Sam’s Club stores. Setting up the “Rock Again” stations in stores across the country is no small undertaking since the displays combine merchandise from multiple departments. The interactive displays can be found in the men’s apparel departments until Nov. 14.